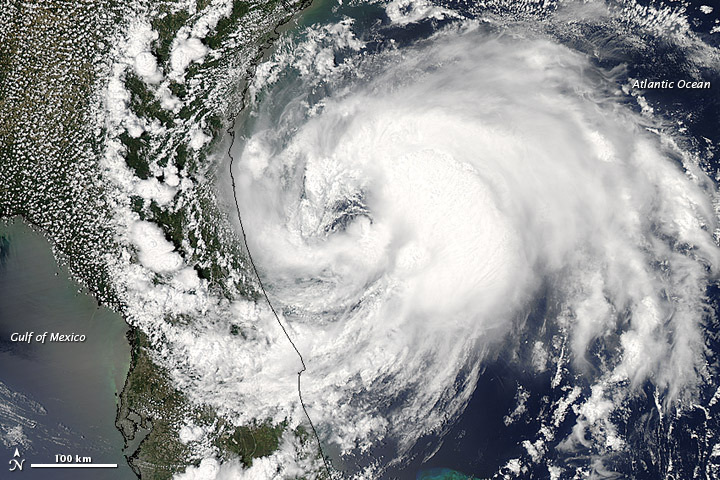 ESSC Scientist Michael E. Mann and alumnus Michael Kozar have released their prediction for the 2012 North Atlantic hurricane season, which officially starts on June 1st. The prediction is for 11.2 +/- 3.3 total named storms, which corresponds to between 8 and 15 storms with a best estimate of 11 named storms. This prediction was made using the statistical model of Sabbatelli and Mann (2007, see PDF here), including the corrections for the historical undercount of events (see notes). The assumptions behind this forecast are (a) that the current sea surface temperture (SST) anomaly (0.35 C from NOAA’s Coral Reef Watch) in the Main Development Region (MDR) in the North Atlantic persists throughout the 2012 hurricane season and (b) near-neutral to slightly warm conditions in the tropical Pacific during boreal Fall/Winter 2012 (see ENSO predictions here) and climatological mean conditions for the North Atlantic Oscillation (NAO) in Fall/Winter 2012. Using the alternative model that uses "relative" MDR SST (MDR SST with the average tropical mean SST subtracted) in place of MDR SST yields a nearly identical prediction (11.23 +/- 3.35 total named storms). In 2007, Mann and Thomas Sabbatelli predicted the exact number of named storms (15) for that season (see 2007 prediction). Mann and Sabbatelli predicted 8 to 15 named storms in 2009, with a lower range of 6 to 13 in the event of a strong El Nino (NINO3 anomaly +1 C or greater, see 2009 prediction). The 2009 season was relatively quiet with 9 named storms partially due to the development of a strong El Nino. In 2010, Mann and Kozar predicted between 19 and 28 named storms, with a best estimate of 23 storms (see 2010 prediction). The National Hurricane Center identified 19 named storms during the 2010 Atlantic Hurricane Season. The prediction of 12 to 20 storms in 2011 (best guess of 16) was also on target as there were 18 named storms during the 2011 season (see 2011 prediction). The alternative "relative MDR" model also performed well, predicting a best guess of 19 named storms with a range of 15 to 23 storms. Mann, M.E., Sabbatelli, T.A., Neu, U., Evidence for a Modest Undercount Bias in Early Historical Atlantic Tropical Cyclone Counts, Geophys. Res. Lett., 34, L22707, doi:10.1029/2007GL031781, 2007. Sabbatelli, T.A., Mann, M.E., The Influence of Climate State Variables on Atlantic Tropical Cyclone Occurrence Rates, J. Geophys. Res., 112, D17114, doi: 10.1029/2007JD008385, 2007. Vecchi, G.A., Knutson, T.R., On Estimates of Historical North Atlantic Tropical Cyclone Activity, J.Climate, 21, 3580-3600, doi:10.1175/2008JCLI2178, 2008. The tropical cyclone series was corrected based on an estimated historical undercount taken from Vecchi and Knutson (2008).